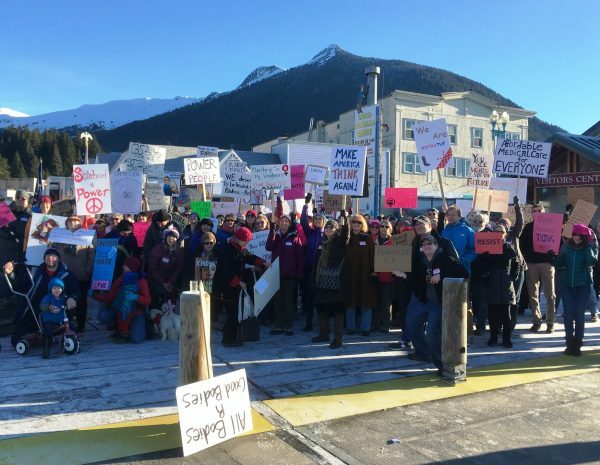 On Jan. 21, Alaskans held local Women’s Marches across the state from Adak to Barrow to Homer to Ketchikan. An estimated 10,000 people participated statewide — far more than expected. For most, attending the march was an opportunity to stand up for women’s rights, indigenous rights, environmental protection and other social issues, but it was only the first step. People braved blizzards, negative temperatures and strong winds to attend the marches statewide. Events were organized around the world initially in response to the negative rhetoric of President Donald Trump’s campaign and potential threats to the rights of women, immigrants, people of faith, people of color and many others. In the far north, about 100 people marched in -23 degree weather in Nome. 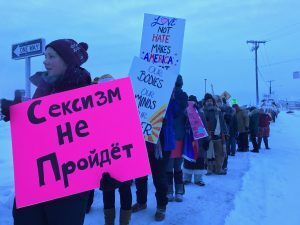 Dozens turned out despite similar temperatures in Utqiaġvik, where some residents say the march was arranged last minute. Ten turned out in Adak in the far western Aleutians. Nine hundred in Homer on the Kenai Peninsula. 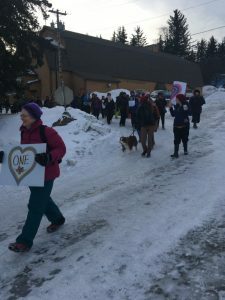 In Haines in southeast Alaska, organizers expected 25 people to show up for the march but instead 150 participated. One of them was Haines High School teacher Patty Brown, who said she’ll continue the spirit of the march by helping her students learn to educate themselves. Marcy Ugstad was in a crowd of about 220 people in Ketchikan. She said for her, the march was about standing together for everyone’s rights, no matter what their opinions. In Sitka, Sitka Conservation Society director Andrew Thoms participated in the march and a direct action fair along with 700 others. He was there gathering signatures to protect public lands. 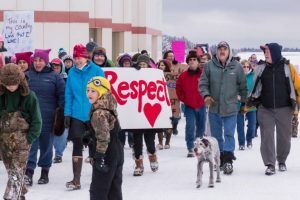 Some of the estimated 3,500 marchers in Anchorage echoed Thoms’ ideas and encouraged people to write to their elected leaders with their thoughts and concerns. 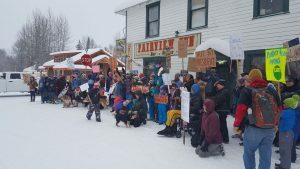 Up the road in Talkeetna, where about 80 people participated, Sarah Kehoe said she plans to use compassion to help people protect their rights and stay safe. Sarah Harrington, one of the organizer’s of Kodiak’s 330-person march, echoed the ideas of supporting one another as a community. KHNS’s Abbey Collins in Haines, KRBD’s Leila Kheiry in Ketchikan, KCAW’s Emily Kwong in Sitka, KTNA’s Phillip Manning in Talkeetna and KMXT’s Kayla Desroche in Kodiak all contributed to this story.